Dear readers, we have some good news and some bad news. The good news, you ask? 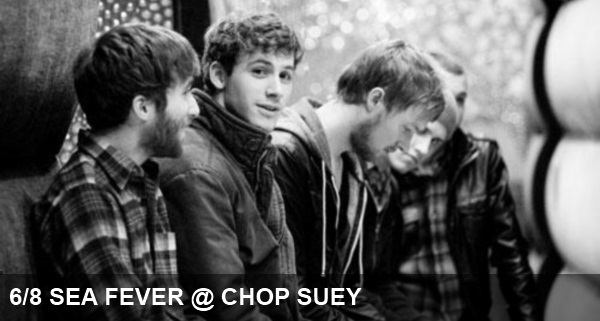 Sea Fever is playing tonight at Chop Suey tonight. They play catchy indie folk pop, and they are big supporters of One Day’s Wages. (For the record: bands supporting non-profits have a direct path to our hearts). They have some great harmonies and heartfelt lyrics, plus an engaging stage presence. Overall, they’re great musicians. So, we bet you’re wondering what the bad news could possibly be. Well, this will be Sea Fever’s last show. (Cue tiny violins.) So if you’d like to see Sea Fever, you HAVE TO go tonight, otherwise you’ll forever regret missing the show.